The sun is pink. The ground is water. It is dawn. The ground is shiny. There is a ship. The ship is white. The ship is 20 meters long. There is a platform. 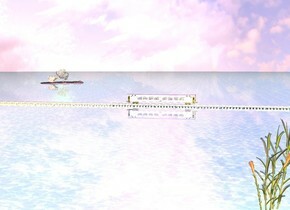 The platform is 60 meters long. A plant is 2 meters behind the platform. A magenta light is above the plant. 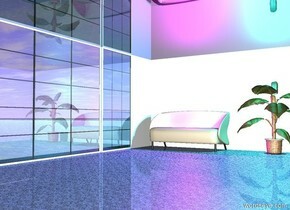 A cyan light is behind the magenta light. The 25 feet tall 1st wall is facing north. The 25 feet tall 2nd wall behind the 1st wall is facing west. It is 50 feet wide. It is 0.1 inch north of the 1st window. It is 10 feet west of the 1st window. The 1st wall is 10 feet wide. The 1st window is right of the 1st wall. The 1st window is 25 feet tall. It is dull. The 2nd window is right of the 1st window. The 2nd window is 25 feet tall and 60 feet wide. A 25 feet tall 3rd wall is right of the 2nd window. The 4th wall is above the 1st wall. The 4th wall is facing down. It is 0.1 inch east of the 2nd wall. It is 0.1 inch north of the 1st window. It is 60 feet tall and 60 feet wide. It is black and shiny. A 5th wall facing north is 50 feet north of the 1st wall. It is 25 feet tall and 60 feet wide. It is white and dull. South of the window is an ocean. The ocean is shiny. The ground is tile. A couch is east of the 2nd wall. It is facing east. It is 10 feet tall. It is cream. It is 4 feet north of the 1st wall. A plant is 1 feet north of the couch. it is 17 feet tall. A magenta light is above the couch. A cyan light is above the plant. It is night. The ground is black. A wall is 10 feet tall and 20 feet wide. It is black. A silver woman is standing in front of the wall. A magenta light is in front of the woman. A cyan light is above the woman. The camera light is pink. Left of the woman is a bright white light. Right of the woman is a cyan light. It is night. The ground is black. A wall is 10 feet tall and 20 feet wide. It is black. 3 feet in front of the wall is a table. A plate is on the table. A banana is on the plate. It is facing west. 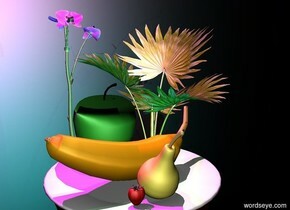 Behind the banana is a lime green apple. A pear in front of the banana. Next to the pear there is a strawberry. A flower is 0.1 inch behind the table. It is 2 feet above the ground. A plant is behind the flower. The plant is 1 inch right of the table. The plant is 1.1 feet above the ground. A cyan light is right of the table. A magenta light is above the flower. A pink light is above the plant. The camera light is white. A dim green light is above the apple. It is morning. The sun is pink. The ground is water. The water is shiny. The camera light is pink. There is a white railroad. It is 200 feet long. It is facing west. A silver train is on the railroad. A magenta light is above the train. A plant is 136 feet in front of the railroad. The plant is 10.5 feet right of the train. The plant is 13 feet tall. A yellow light is 3 feet in front of the plant. An island is 250 feet behind the railroad and 130 feet left of the train. There is a 20 feet tall tree on the island. A rock is next to the tree. The rock is 10 feet tall. There is a green light above the island. An orange light is left of the island. There is a brick road. It is yellow. It is 180 feet long. There is a rainbow behind the road. It is 20 feet tall. The sun is pink. It is dawn. 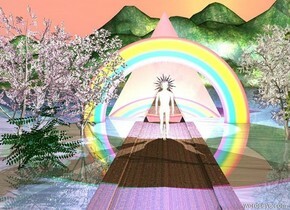 A pyramid is behind the rainbow. It is white and transparent. It is 10 feet tall. 2nd pyramid is behind the pyramid. The 2nd pyramid is silver. It is 30 feet tall. 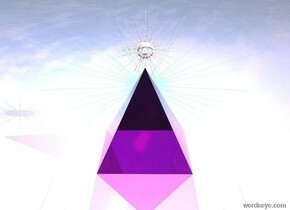 A magenta light is above the 2nd pyramid. A cyan light is above the pyramid. A man is on the road. The man is white. The man is shiny. The man is 10 feet tall. The man is 30 feet in front of the pyramid. A star is behind the man. The star is transparent and shiny. It is 7.5 feet above the ground. An eye is 2 inch in front of the man. It is 10 feet above the ground. A white light is behind the star. 1st tree is left of the road. It is 20 feet tall. It is 10 feet in front of the rainbow. 2nd tree is 5 feet in front of the 1st tree. It is 20 feet tall. A bush is 3 feet in front of the 1st tree. It is 10 feet tall. 3rd tree is 10 feet right of the man. The 3rd tree is 20 feet tall. 4th tree is 5 feet in front of the 3rd tree. The 4th tree is 20 feet tall. There is a wall. It is grey. It is made of brick. It is 10 feet tall and 10 feet wide. There is a black cube in front of the wall. The cube is 3 feet tall. There is a skull on the cube. There is a candle 3 inch right of the skull. The candle is 9 inch tall. The candle is black. 2nd candle is 2 inch left of the skull. The 2nd candle is black. It is 9 inch tall. 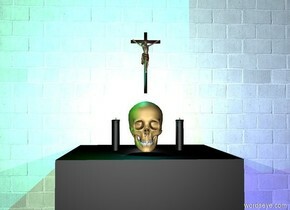 A cross is 2 inch above the skull. It is 15 inch tall. There is a green light above the candle. There is a cyan light above the 2nd candle. There is a blue light right of the cube. It is night. A white light is behind the skull. The ground is shiny. It is afternoon. There is an enormous white light six feet above the ground. A shiny transparent man is on the ground. The man is white. The man is eight feet tall. There is a white light behind the man. 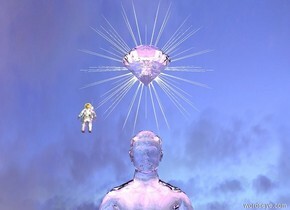 There is a shiny white star 0.5 inch above the man. There is a magenta light behind the star. There is a magenta light above the man. There is an enormous diamond 3 inch in front of the star. It is 1 inch above the man. There is an astronaut next to the man. The astronaut is 1 feet tall. The astronaut is 8 feet above the ground. The ground is shiny. There is a transparent magenta pyramid on the ground. It is morning. There is a magenta light above the pyramid. There is a shiny eye 1.5 inches above the pyramid. A very small white star is 2 inches behind the eye and 6.5 inch above the ground. There is a cyan light behind the star. A silver woman is standing on the ground. The ground is shiny. There is a magenta light left of the woman. There is a pink light right of the woman. There is a white light in front of the woman. There is a cyan light above the woman. There is a very small rainbow two feet behind the woman. It is shiny. It is dusk.